The development of intelligent environments from scratch means an arduous and complex process. In these environments, the integration of sensors and the design of processing information in real time are key aspects in order to generate feasible solutions. 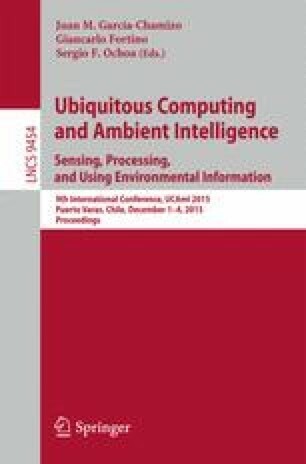 To shed light on this context, in this contribution, we present an architecture for information processing based on object distribution services. The capture and processing of data are developed ubiquitously within mobile devices and ambient computers by means of peer to peer based on fuzzy temporal subscriptions. The main advantage of the use of fuzzy temporal subscriptions is that the information is received by a subscriber when it reaches a desired level of relevance for this subscriber, implying a decrease in the communication burden in the architecture. In order to illustrate the usefulness and effectiveness of our proposal, a scene of an user performing an activity in an intelligent environment is described by means of his interactions with the environmental objects and the identification of users by marker-based tracking. This contribution has been supported by research projects: CEATIC-2013-001, UJA2014/06/14 and TIN-2012-31263.